The news has been confirmed. Ubuntu One Music Store is how it is going to be called. And it will be there by default in Rythmbox Music Player in Ubuntu Lucid 10.04. And that is NOT welcome because most of us don't use Rythmbox at all. 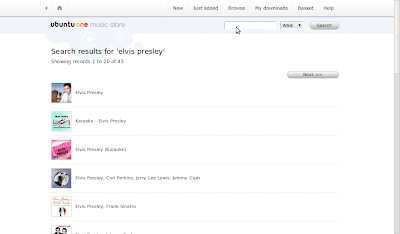 But hold on, Ubuntu One Music Store is going to have a plug-in support as well. That is sweet! Ubuntu One Music Store will be powered by 7 digital and that is a welcome development because they had the largest selection of songs available without digital rights management (DRM) for the most regions around the world. Songs purchased through the Ubuntu One Music Store are available in high quality 256 kbps (sometimes higher) MP3 audio encoding and will be completely DRM free! 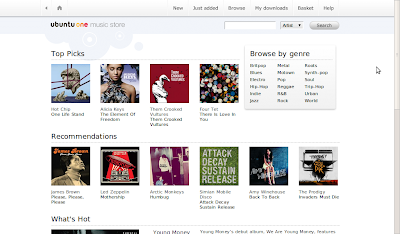 The Ubuntu One Music Store has features that users expect from an online store say for example, Search by artist, album, or track; Browse recommendations and genres; Discover new releases or just released songs each week; A convenient shopping basket ; Support for a variety of payment options and so on. 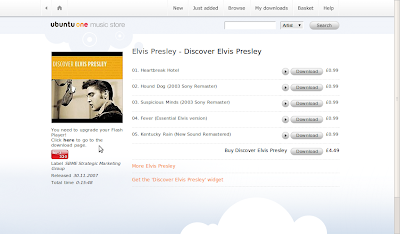 Here are some screenshots on how Ubuntu One Music Store is going to be like. These screenshots are NOT taken from embedded online store in Rythmbox, instead from a browser. It is to give you a preview on how things are going to be with Ubuntu One Music Store in Lucid. An Ubuntu One account is required to purchase songs from the Ubuntu One Music Store. Ubuntu One accounts are free and comes with 2 GB of personal cloud storage. Purchased songs are automatically transferred to your cloud storage, synchronized to all of your computers, and added to Rhythmbox. Ubuntu One Music Store FAQ and screenshots via Popey.